Liverpool boss Rafael Benitez admits his summer transfer plans have been thrown into doubt after striker Djibril Cisse broke his leg playing for France. The 24-year-old was tipped for an £8m transfer to Marseille or Lyon which would have boosted Benitez's kitty. But Cisse broke the tibia and fibula in his right leg in France's last warm-up game before the World Cup on Wednesday. Benitez told the Liverpool Echo: "We planned to use the money for other players. Now we won't have this money." Cisse missed most of the 2004-05 season with a similar injury to his left leg sustained at Blackburn in October 2004. 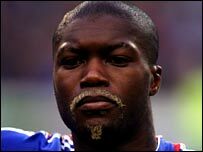 And Benitez said: "I'm really sorry for Djibril. That's important. It's really unfortunate for him. "But it's true it's now impossible for him to be sold. "We won't expect him to play again until November or December." The Liverpool manager stressed there would be no problem establishing a working relationship again. He added: "It was a professional decision and we were honest with Djibril. There will be no problem when he comes back."